Is it worth comparing approaches to the machine learning process? Are there any fundamental differences between such frameworks? Though classical approaches to such tasks exist, and have existed for some time, it is worth taking consult from new and different perspectives for a variety of reasons: Have I missed something? Are there new approaches which had not previously been considered? Should I change my perspective on how I approach machine learning? The 2 most recent resources I've come across outlining frameworks for approaching the process of machine learning are Yufeng Guo's The 7 Steps of Machine Learning and section 4.5 of Francois Chollet's Deep Learning with Python. Are either of these anything different than how you already process just such a task? What follows are outlines of these 2 supervised machine learning approaches, a brief comparison, and an attempt to reconcile the two into a third framework highlighting the most important areas of the (supervised) machine learning process. I actually came across Guo's article by way of first watching a video of his on YouTube, which came recommended after an afternoon of going down the Google I/O 2018 video playlist rabbit hole. The post is the same content as the video, and so if interested one of the two resources will suffice. Good train/eval split? 80/20, 70/30, or similar, depending on domain, data availability, dataset particulars, etc. Simple model hyperparameters may include: number of training steps, learning rate, initialization values and distribution, etc. In section 4.5 of his book, Chollet outlines a universal workflow of machine learning, which he describes as a blueprint for solving machine learning problems. 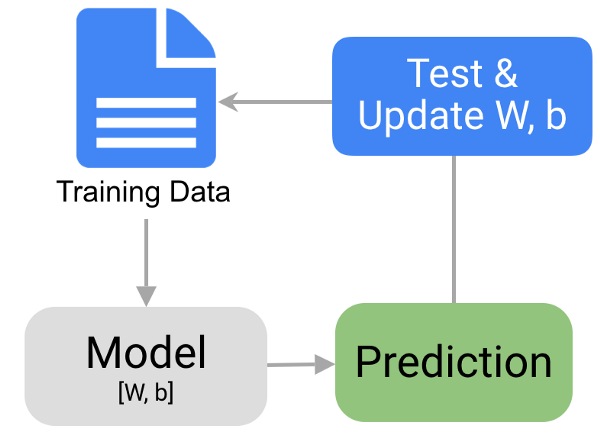 The blueprint ties together the concepts we've learned about in this chapter: problem definition, evaluation, feature engineering, and fighting overfitting. We can reasonably conclude that Guo's framework outlines a "beginner" approach to the machine learning process, more explicitly defining early steps, while Chollet's is a more advanced approach, emphasizing both the explicit decisions regarding model evaluation and the tweaking of machine learning models. Both approaches are equally valid, and do not prescribe anything fundamentally different from one another; you could superimpose Chollet's on top of Guo's and find that, while the 7 steps of the 2 models would not line up, they would end up covering the same tasks in sum. It's not perfect, but I stand by it. In my view, this presents something important: both frameworks agree, and together place emphasis, on particular points of the framework. It should be clear that model evaluation and parameter tuning are important aspects of machine learning. Addition agreed-upon areas of importance are the assembly/preparation of data and original model selection/training. So, which framework should you use? Are there really any important differences? Do those presented by Guo and Chollet offer anything that was previously lacking? Does this simplified framework provide any real benefit? As long as the bases are covered, and the tasks which explicitly exist in the overlap of the frameworks are tended to, the outcome of following either of the two models would equal that of the other. Your vantage point or level of experience may exhibit a preference for one. As you may have guessed, this has really been less about deciding on or contrasting specific frameworks than it has been an investigation of what a reasonable machine learning process should look like.